Are you a magazine addict? I think I might be. As I write this, I have stacks and stacks of magazines sitting on the floor behind me. I may actually have a bit of a magazine hoarding issue. I also have a lot of books thanks to a life-long reading habit. In spite of all the digital wonder out there, I still like to read real, hard-copy books and magazines. I suspect I will purchase some books in digital format; but I also know that hard-copy books are still in my future. That leaves me with the problem of how to deal with the stacks of magazines that I can't part with, all of my books, and any new additions in a manner that looks neat and tidy and pretty and display-worthy. 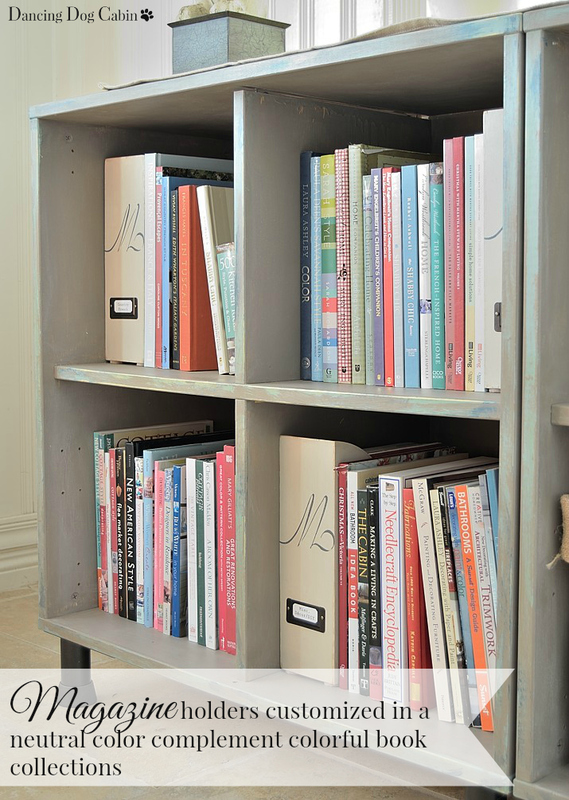 Using all the cookbooks, home decor and DIY books, and magazines that live in my recently reinvented Ikea bookcase (click here to read more about this project), I'll show you how I did this in this 'working' bookcase. 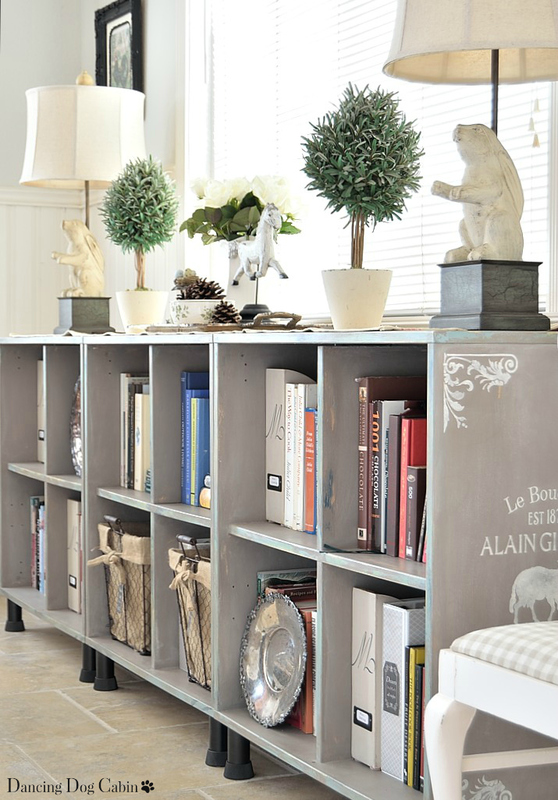 Storing magazines, paperback books, recipes, and other necessary paper items in a bookcase can result in visual clutter. The best way to control this is to use containers and bins to store everything you don't want to see. 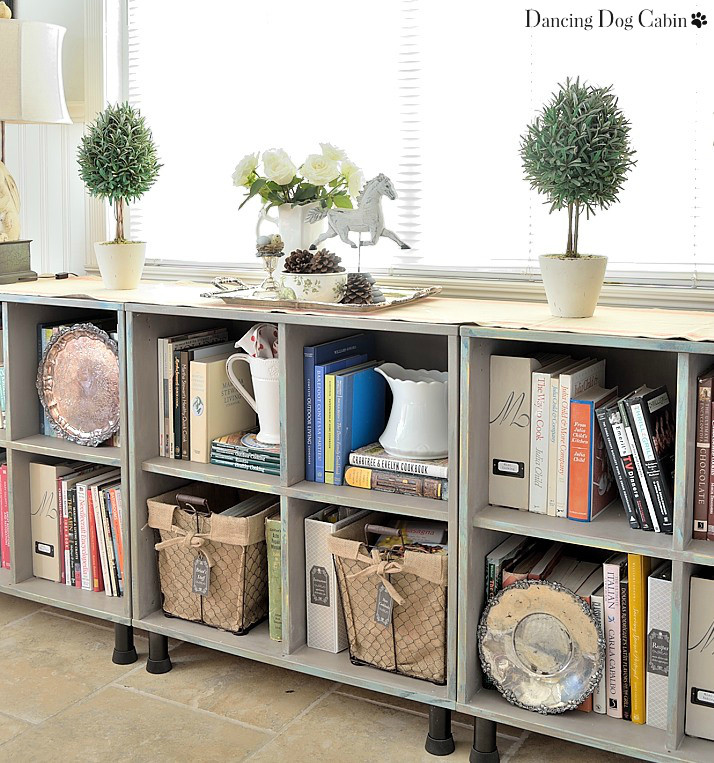 Labeled magazine holders are a good choice for containing, organizing, and hiding magazines. But nice magazine holders get expensive, especially when you are buying them in multiples. And for my project here, I didn't want to spend the next 6 months hunting for the perfect magazine holder that complemented my newly made-over bookcase. Final answer? Customizing the inexpensive, unfinished magazine holders available at Ikea (at about $9 per a package of two). Note this is not a sponsored post. The photo collage below provides a quick overview of how I did this. I created the labels in Word by using a table of even grids, each at a size that would fit into the label holders. The grid lines provided a guideline for cutting out each label. Creating double-layer labels by folding in half (see No. 4 above) keeps the label from sliding around once inserted into the label holder. I used the felt pads on the bottom of each holder to protect the bookcase. I kept the finished look of the magazine holders simple and neutral so that they complement their colorful book neighbors (more on this below). 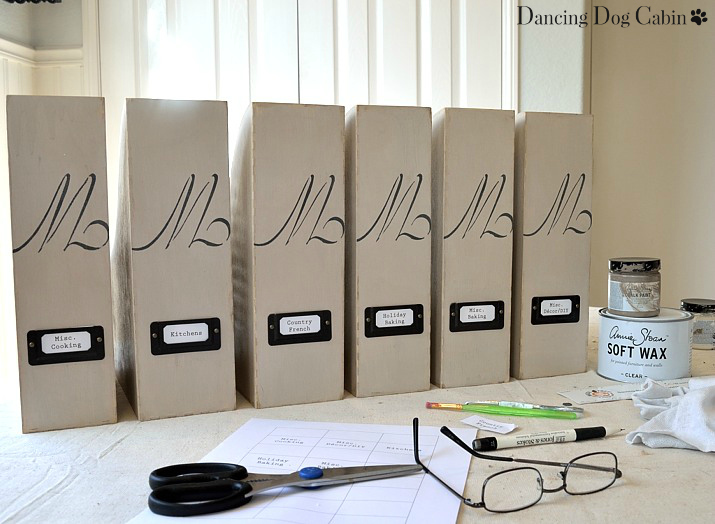 I also chose to have the tall side of each holder facing outward so that the magazines are hidden. Other residents of this bookcase that I don't want in plain sight include lots of recipes either hand-written, typed, or torn out from a magazine (I can't be bothered to type or scan recipes into a software organization program), and all the instructions for our appliances, electronics, etc..
Binders are perfect for organizing this kind of thing. 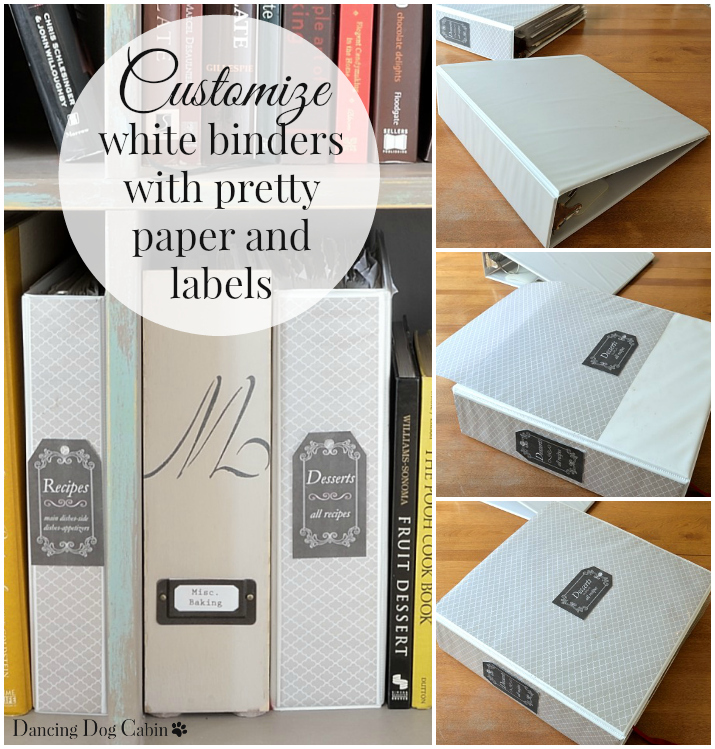 Using the inexpensive white plastic binders you can get at any office supply is another opportunity for customizing. Just cut out some pretty paper to fit (I used scrap booking paper), slide under the clear plastic cover, and add a decorative label. I used Avery labels and their free online label design program---very nifty! I threw all of our small paperback cookbooks into a couple of bins. 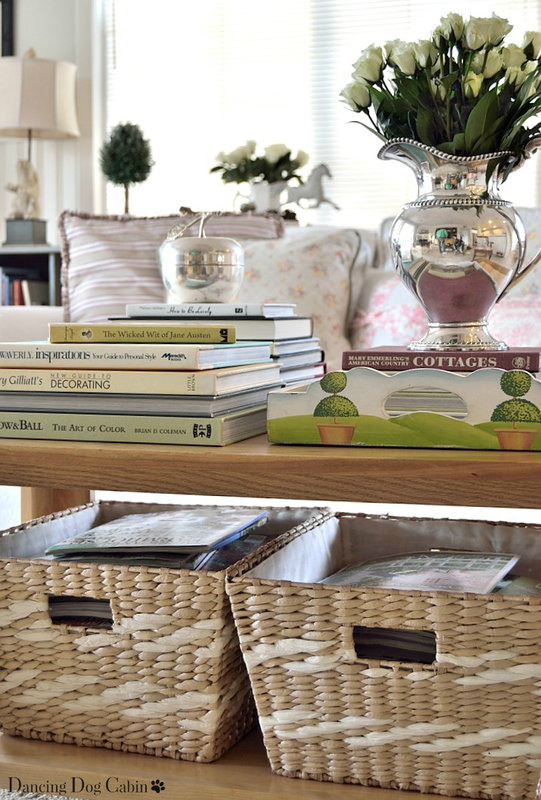 With the huge selection of storage bins and boxes out there, it's so easy to find something that suits your purpose and style. 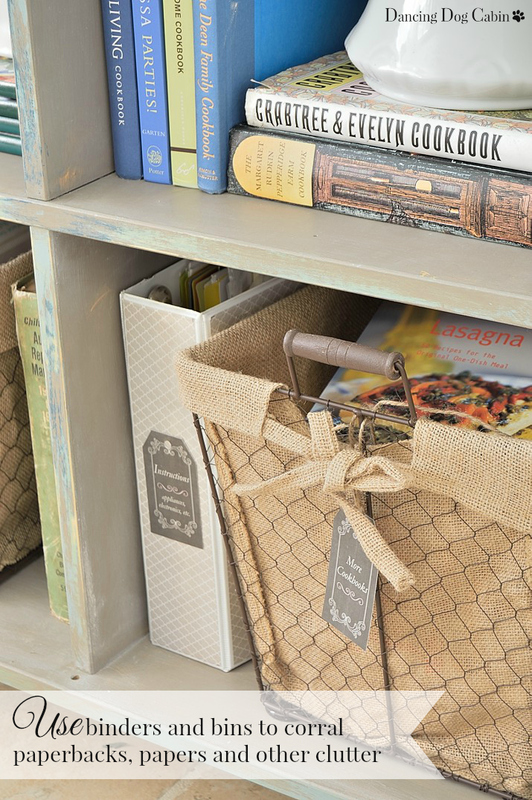 I chose these rustic, chicken wire and burlap bins because they fit in beautifully with the French Country-style of the bookcase. Again, using labels helps to keep track of everything. 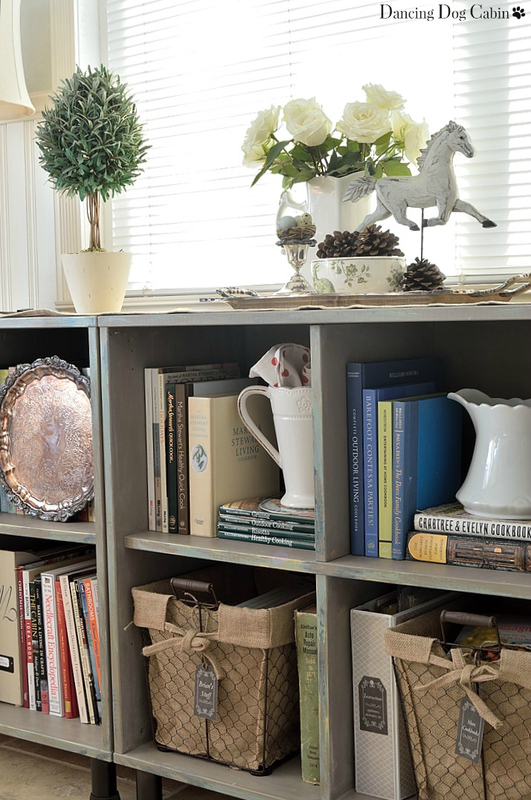 The organizational items, the magazine holders, binders, and chicken-wire bins, are in soft, buff and putty colors and rustic materials that complement the color and style of the bookcase and balance the varied book colors. 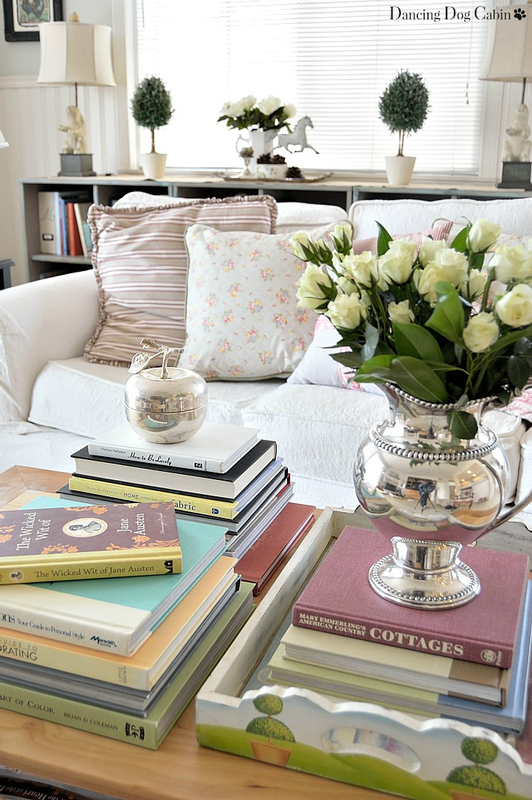 The silver trays and white ceramic vases also act as neutrals that are a good foil for the busy-ness of all the books. 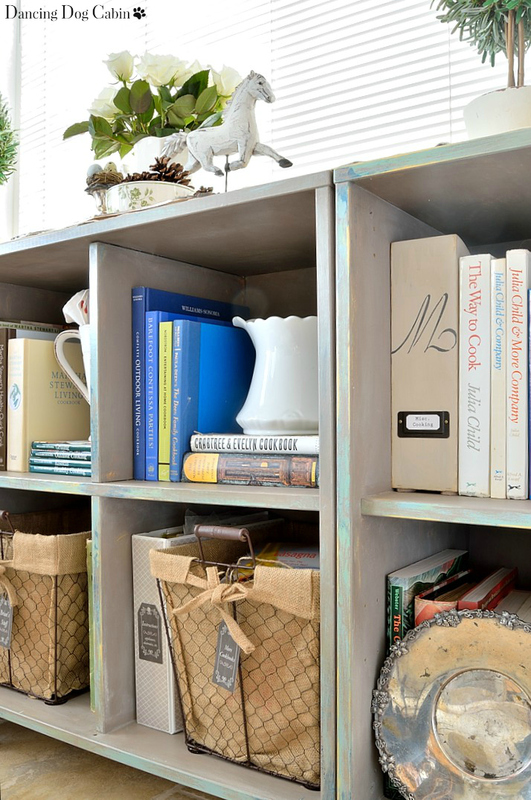 The round, gleaming trays juxtapose nicely with the vertical lines of the books and help to break up the extended blocks of books in each cubby. I read somewhere that you should cover all of your books with matching dust covers for a more cohesive look. That's never going to happen in my house, I just don't have that much spare time or patience. However, I do like to remove the dustcovers that come with most books since often the colors of the book covers underneath are a softer, pretty color. I stacked a couple books that are used infrequently, but in general, stored most of the books vertically. Stacking books that are used all the time just doesn't work here in this 'working' bookcase. Having to extract, for instance, a much-used grilling cookbook from the bottom of a big stack of books would not be viewed with much favor in my household. Another piece of bookshelf-advise that went out the window is to organize books by color. Again, this is impractical for this collection of books since I don't want to go on a hunting expedition every time I need a particular cookbook. Instead, I group each book by subject or author and locate everything according to its purpose. For instance, all my chocolate baking books are in the top right cubby closest to the kitchen (for obvious reasons; anything concerning chocolate should always be readily accessible), all other baking cookbooks are in the cubby below; to the left Martha Stewart shares a cubby with Williams Sonoma and Julia Child shares another cubby with Emeril and assorted hearty- fare cookbooks (I'm sure she wouldn't mind); and decorating books are located the furthest from the kitchen at the far left end. Although, I will say, I did try to arrange the books within each category in pleasing color combinations as much as possible. Obviously, it can be a little of both. The ratio of display to practical storage and organization depends entirely on your particular needs and ultimate goals. 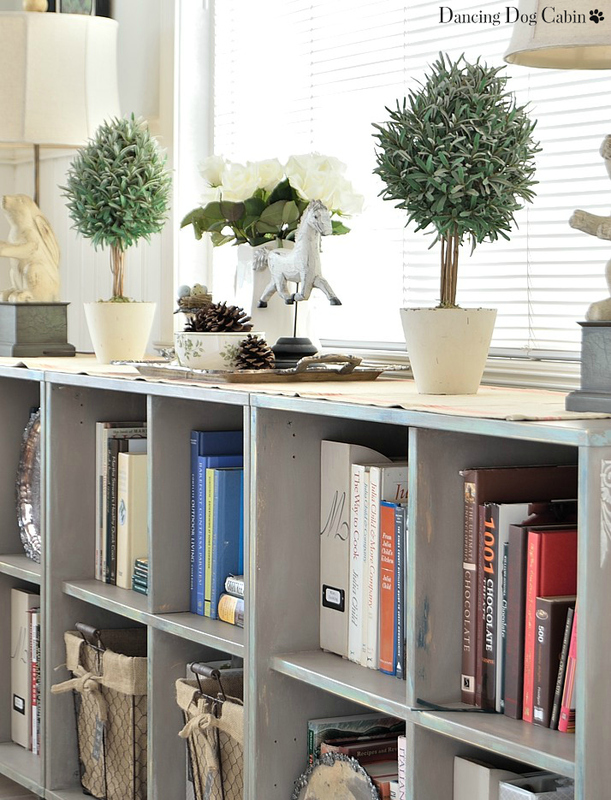 You have turned your Ikea book case and the contents into a work of art! I love the way you've pulled it all together so beautifully. I don't buy or read too many magazines, but I love design books. That is a real weakness. Yours look amazing. Thanks Marty! 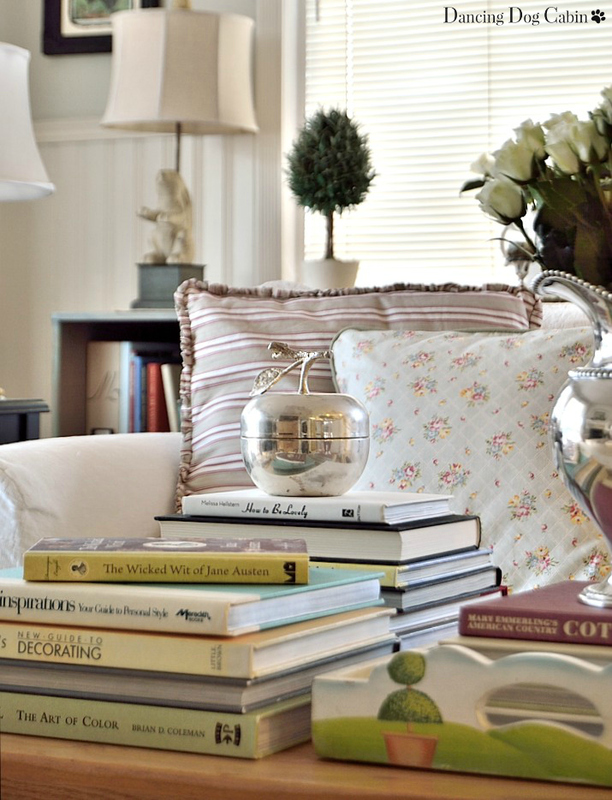 Gorgeous design and decor books are a weakness of mine too. I hope you're having a wonderful New Year. Thank you Rue, I'm so glad you enjoy my blog! As far as who found who, I don't remember either, but either way, I'm glad too. I always enjoy everything you have to say on your blog! What an absolutely marvelous post!! I don't feel so guilty now over my magazine and book collection. I would love to be a fan of digital reading but adore a paper magazine, a cup of coffee and a comfy chair. Your organizational skills are amazing. Thank you! Yes, I don't think I will ever completely forgo real magazines and books either. I'm just trying to balance digital w/ hard copy so that I don't end up with a house filled with stacks of books and magazines. I have done something similar with our Expedit. I organized my books by color - and I see that we have a lot of the same books. 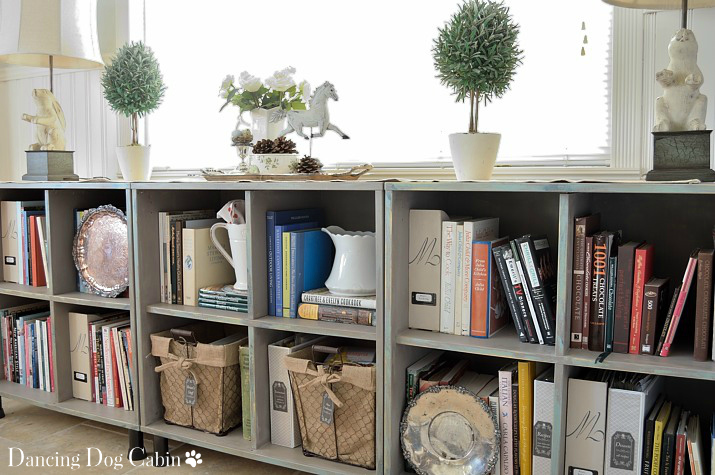 Thank you so much for posting about displaying a working bookcase. 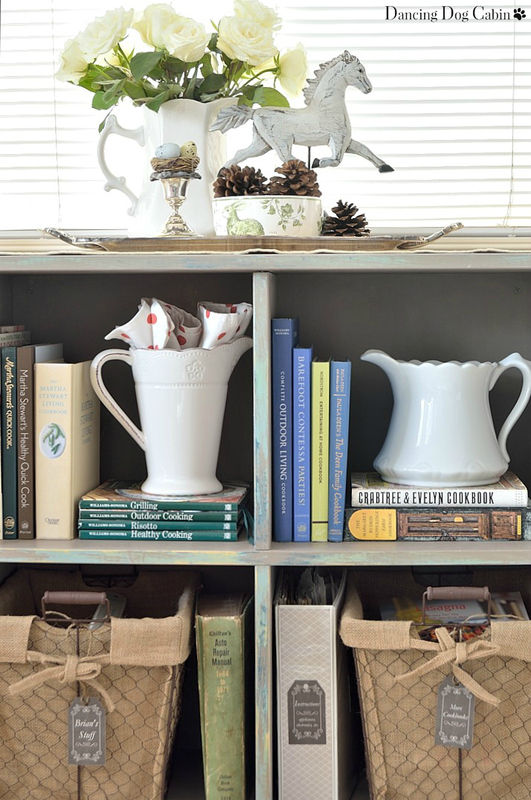 I get so frustrated with all the bookcase tips about knick knacks and interesting objects. They look lovely, but my bookcases have books. That we use. You shelves look amazing, so I will definitely be using your tips. Pinning so I remember! Thanks Rebecca, I'm glad my post was helpful! As you say, using bookshelves just for display if you have a lot of books is just not very practical. Thanks Amy! I don't know why it's so hard to get rid of magazines. I'm trying to find balance between digital and hard copy so I don't end up buried beneath an avalanche of magazines one day. These are great tips! I try to get rid of magazines often to prevent from becoming the hoarder I used to be, but I buy so many and I have a hard time letting go of the ones with articles I love. I definitely feel much better about keeping them around after seeing your storage solutions. Thanks for sharing at Inspiration Thursday! Thanks for visiting Lela! 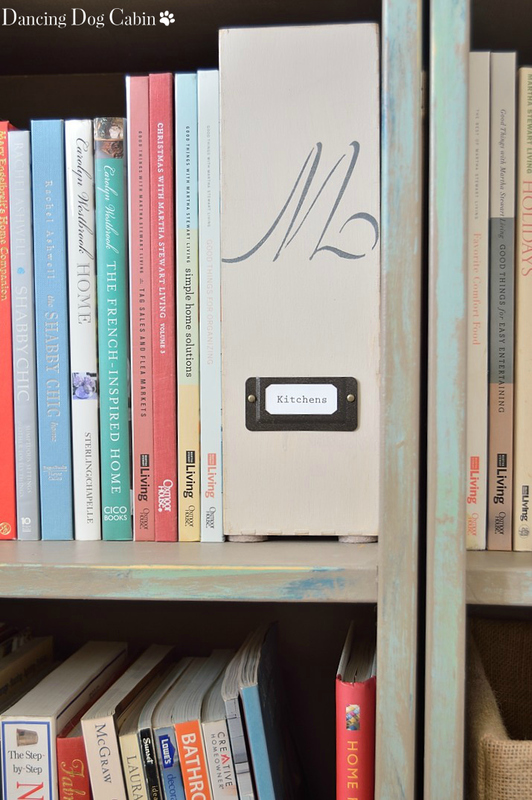 Finding creative ways to store/hide magazines in plain sight definitely makes it easier to keep them around. These look amazing! I really like the magazine holders! Thanks for sharing! 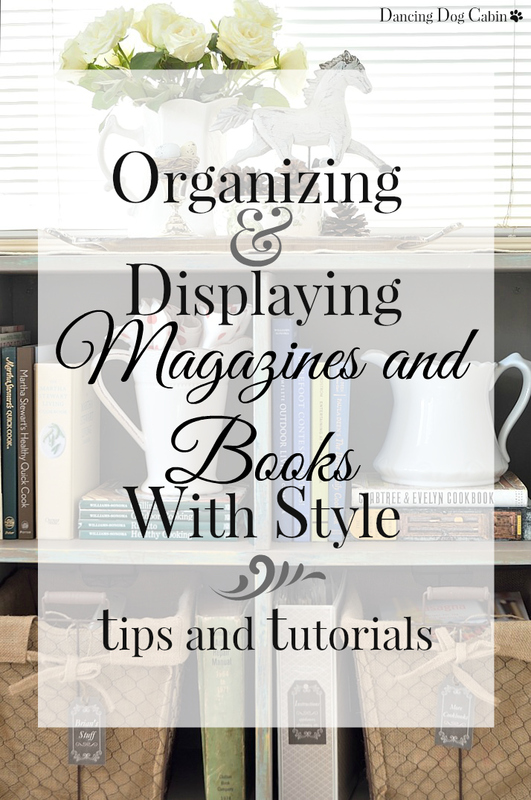 Great tips for organizing! I really love those chicken wire baskets.